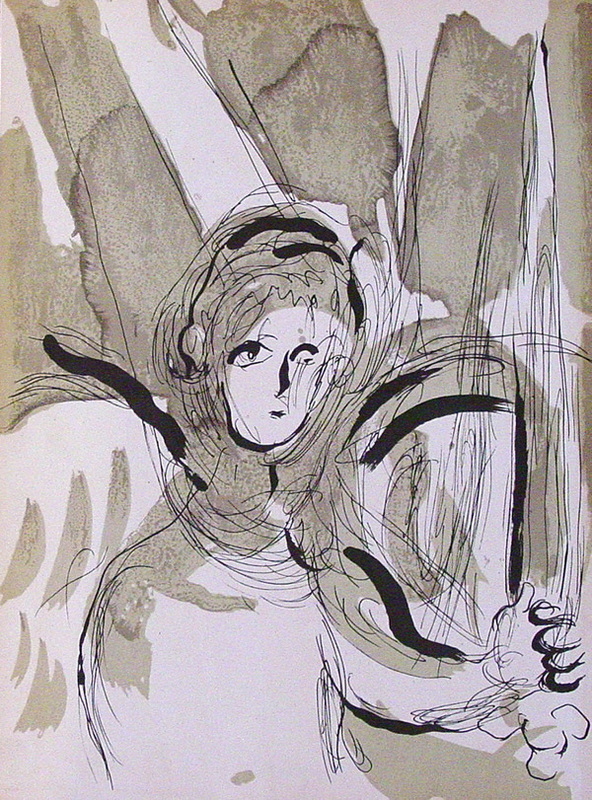 Chagall surprises us with this angel who flutters its wings and bends backwards while holding the Tablets of the Law. 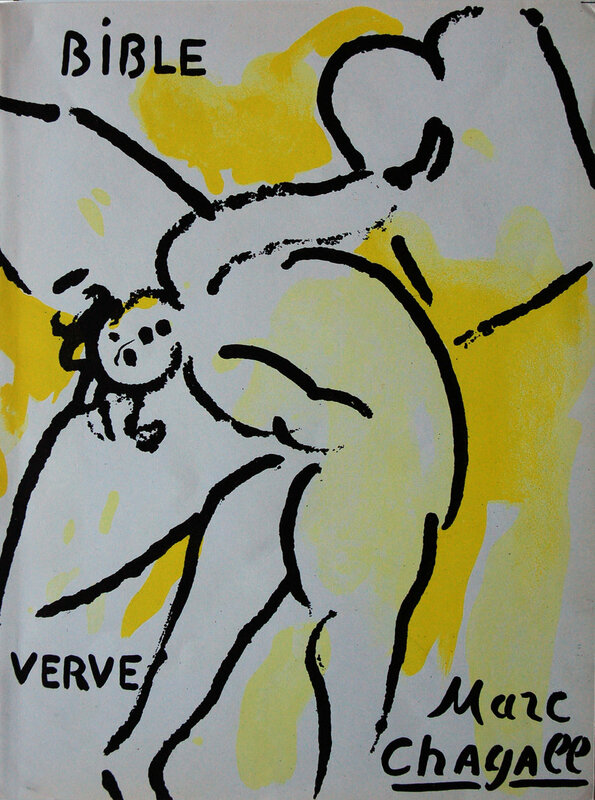 This image was a title page for Verve, the art magazine that first published these original lithographs by Chagall on the Bible. 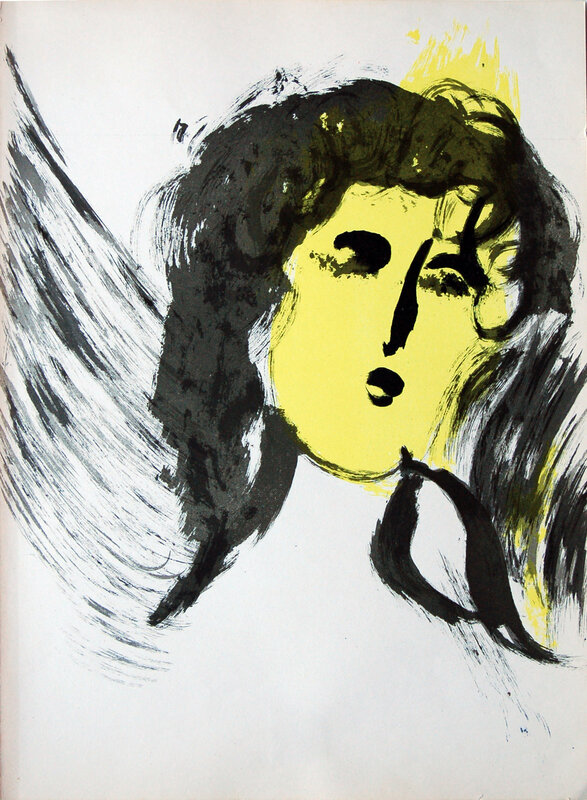 The cover of the special 1960 Verve publication was an original lithograph of a striking angel. Adam and Eve are no longer in the Garden but have been banished by the Angel with Sword who stands guard to keep them from the Tree of Life. The Angel of Paradise accompanies Adam and Eve and all is quiet and at peace in the Garden of Eden. 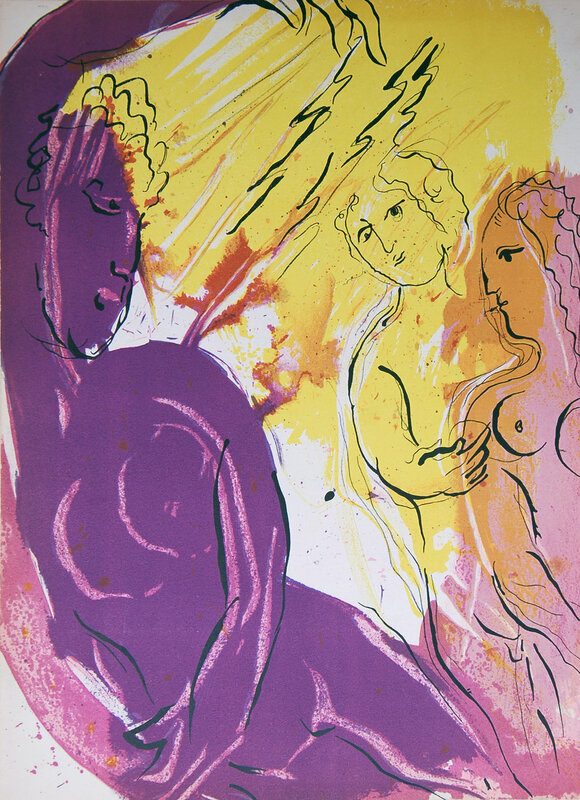 In this series of lithographs Chagall has chosen to create four images of angels. This yellow angel is simply and directly drawn, but the mouth suggests singing. The eye naturally rests on Chagall’s bright green donkey that in biblical times was considered a peaceful and good-natured animal. The donkey’s head appears decorated as for a pageant. To the left side, Adam and Eve are visible. They enjoy the fruit of the Garden of Eden. This lithograph depicts Eve, naked, and exposed, a consequence of her guilt. However, God hasn’t abandoned her. In the upper left-hand corner, there is a Hebrew tetragrammaton JHWH, the letters of God’s name Jahweh. The big tree protecting Eve with its extended branches reinforces this concept. Chagall has pictured an angel with a sword in the process of driving Adam and Eve from the Garden of Eden after they have disobeyed his command not to eat of the tree of the knowledge of good and evil. A dramatic change occurs in Chagall’s Banished from Paradise—now the tone is one of fear and fright as Adam and Eve are driven by an angel out of the Garden of Eden. Strong reds and oranges intensify the drama. Chagall holds nothing back in his depiction of the story of Cain and Abel. He shows the savage act of murder as Cain thrusts a knife into the heart of Abel. Abraham and his wife Sarah are tenderly portrayed in this delicate blue lithograph. As Sarah, in a pensive moment, touches her hand upon her throat, Abraham lovingly reaches for her shoulder. A woman mounted on a camel in the upper left corner suggests that perhaps she is considering the journey ahead as they leave their homeland to leave for distant lands that the Lord has called them to inhabit. Chagall portrays Sarah as a beautiful woman with three angels hovering nearby. Angels played an important role in Sarah’s life—they announce that she will bear a son and they protect her from danger in a foreign country. When Abimelech, king of Gerar, takes Sarah with Abraham’s permission, God abruptly enters into the situation to protect her, speaking to Abimelech in a dream. After God informs him that Sarah is really Abraham’s wife, Abimelech confronts Abraham. This lithograph depicts Rachel leaving her father’s household to follow Jacob. She is sitting on her camel opposite her father who demands the stolen graven images that she hid in the saddlebags of her camel. She said she was unwell and prevented her father’s search. Tamar, whose husband had died, was the daughter-in-law of Judah and also the mother of two of his children. Judah ordered that she be burned to death when she was found pregnant. Tamar sent the staff, seal, and cord to Judah with a message declaring that the owner of these items was the man who had made her pregnant. Upon recognizing these items as his security, Judah released Tamar from her sentence. For the 1956 suite of biblical themes Chagall has created four versions of Moses receiving the Tablets of the Law. This one portrays Moses’ face and hands in a vibrant red, almost as if on fire, while he holds the two tablets of the Ten Commandments. 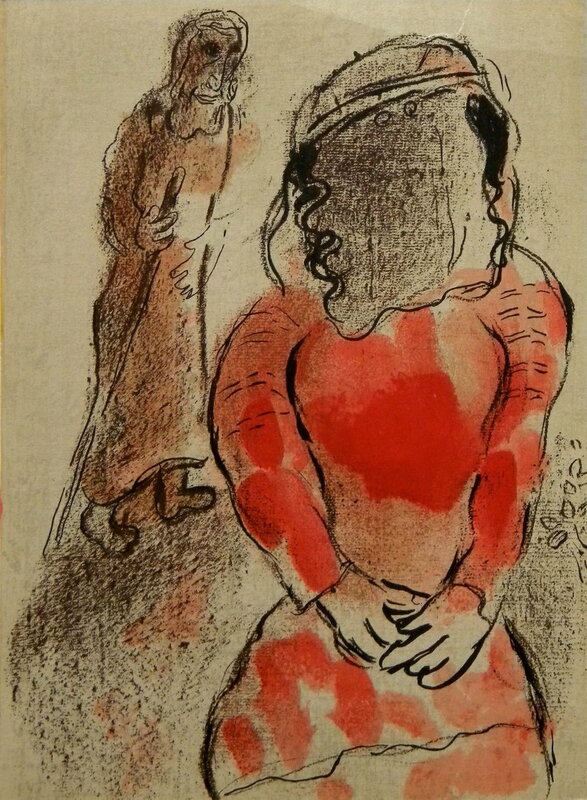 As in the first images of Moses, Chagall has portrayed Moses with protrusions coming from his head. Historically these were considered horns. They were the result of a mistranslation of the Hebrew Bible into the Latin Vulgate Bible with which he was familiar. 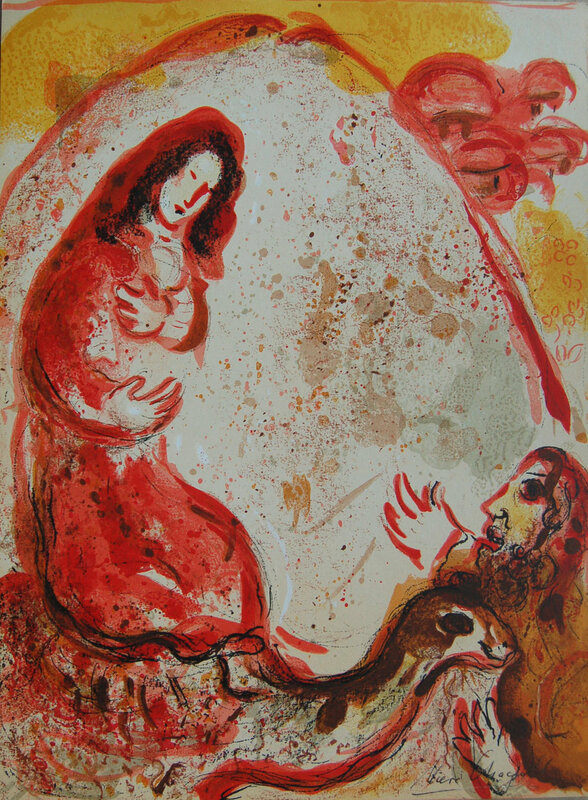 The Hebrew word taken from Exodus means either a ‘horn’ or an irradiation.” Chagall has honored that tradition, but leans more toward the idea of rays of light emanating from the head of Moses. God’s hand extends from behind a black lightening cloud to give Moses the Tablets of the Law. Moses reaches upward to receive the Ten Commandments, with a set of biblical principles relating to ethics and worship for the Israelites and all coming generations.